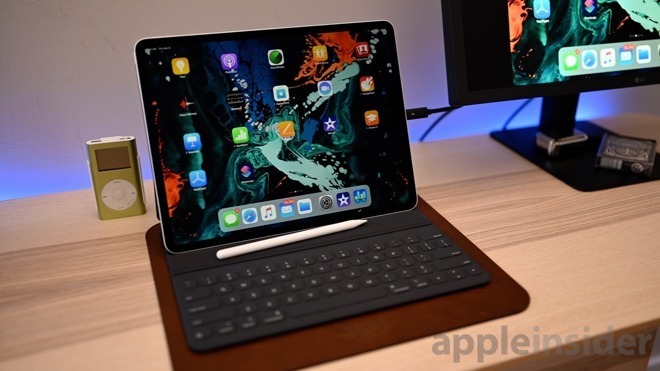 Expressing difficulty in acquiring data on the new iPad models, Troughton-Smith posted on Twitter “It seems like both iPad sizes support a Smart Keyboard and Pencil.” While the iPad has included support for the Apple Pencil since 2018, the Smart Keyboard would be a new element to the product line. Introduced with the iPad Pro, the Smart Keyboard uses contacts on the iPad casing for power and data transfers, effectively allowing the keyboard to function when connected, without using an extra battery or Bluetooth for communication. For it to be included in the iPad, there would have to be a similar contact point included in its design, which again would be a new feature borrowed from the iPad Pro family. In the same tweet, Troughton-Smith muses on data raised last week from the latest beta of iOS 12.2, in that they would continue to use Touch ID and not switch to Face ID, an authentication method used on current-generation iPhones and the iPad Pro. He tweets “it’s possible that neither include Touch ID (nor Face ID),” before adding it would be hard to imagine Apple shipping without Touch ID unless it was to do with cost or another financial benefit. On Friday, the Eurasian Economic Commission revealed model numbers for seven new iPad devices. While unconfirmed, the grouping of model numbers suggests there to be two distinct devices, potentially combining a refreshed 9.7-inch iPad with a fifth-generation iPad mini. It is unclear if the Smart Keyboard comment is just for the 9.7-inch iPad model, or applies to the rumored pint-sized tablet as well.